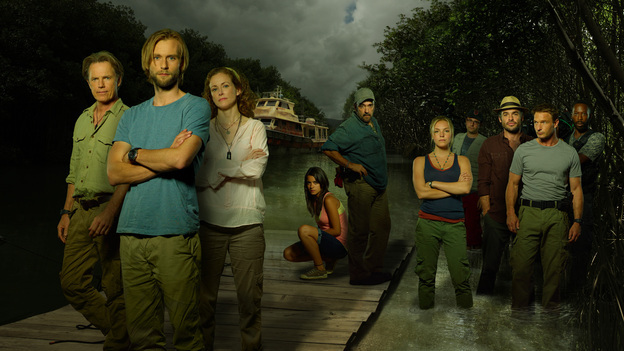 Popdose's Winter 2012 TV Preview: "The River"
“Found footage” horror finds its way to TV. I love horror, fantasy, and science fiction movies. I’m mixed (at best) on horror, fantasy, and science fiction movies made in the “found footage” style popularized by The Blair Witch Project, which has been recycled for better ([REC], and its US remake Quarantine, Cloverfield) and for worse (The Devil Inside) far too much on our screens. And outside of a few shows (the current incarnation of Doctor Who, the original runs of The Twilight Zone, The Outer Limits, and Kolchak: The Night Stalker, bits and pieces, so to speak, of The Walking Dead, and a handful of others) I’m not real keen on horror, fantasy, and science fiction on TV. Which meant The River, a horror show that brings the found footage gimmick into our living rooms, had two strikes against it going into Tuesday’s two-episode premiere. And any program hyped and hyped (and hyped some more) as as the “next TV phenomenon” automatically prepares me for a letdown, particularly when it arrives hot on the heels of Monday’s “next TV phenomenon,” Smash, both of which are executive-produced by Steven Spielberg–whose Terra Nova, fall’s “next TV phenomenon,” was a complete non-starter with me (and it takes a lot to make me not want to watch a dinosaur show.) Color me skeptical. Most important, I’d say, in the grand scheme is young Jahel (Paulina Gaitan), who seems to be in touch with the unquiet spirits that are soon found to be haunting the river. Every “reality horror” needs to put a kid in ambiguous jeopardy, and by Episode 2 Jahel was spitting dragonflies. Some viewers who had signed on for a look-see, however, missed that spectacle–no surprise, as long before that the two hours had established a not particularly interesting rhythm, of lots of shakycam slinking around abandoned cabins and leafy jungles, with ominous music playing and the characters screaming “What the hell is that?” and so on seconds before the Hyundai and credit card commercials rolled. On your way, I should say. One-quarter down The River and color me gone. The good news is that there are only six episodes left, a minimal order that should keep the show focused on “the source” (unlike the attention-deficit chills of An American Horror Story, which like every Ryan Murphy show jumped the shark every 20 minutes or so) or from succumbing to subplot sprawl (like The X-Files, a good show detoured into banality). Explorers, take heart–maybe, just maybe, some actual magic will be found in all that footage.